Raypak Condensing Boilers are one of the most efficient and effective commercial boilers being used today. 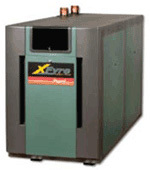 The Raypak XFyre Condensing Boiler is a green boiler, which will cost less to operate. These condensing boilers are be vented with PVC and can be installed as an indoor or outdoor installation depending on your application. The all new Raypak XFyre is fabricated from over 60 years experience. Raypak is one of the best selling commercial condensing boilers being used today. The Raypak XFyre Condensing Boiler is available in three different sizes. These commercial boilers are available in 300,000, 500,000 and 850,000 BTUH. Each of these boilers offer an energy efficiency rating of 94% for Cat 4 hydronic boilers as well as a 94% efficiency Cat 4 domestic hot water that is rated for up to 99% part load. Each of these boilers is more compact than the condenser boilers of even 5 years ago. These commercial boilers offer less than a 9-½ square foot of space. The Raypak XFyre Condensing Boiler offers both indoor and outdoor installations. These boilers are 100% protected from UV rays; they also come with a weatherproof control panel. The XFyre is the only condensing boiler that offers CSA outdoor approval. There is a minimum inlet temperature of 32 degrees Fahrenheit. Each size boiler comes with a modulating gas valve and burner with up to a 5:1 turndown ratio. Some of the other key features of the Raypak XFyre Condensing Boiler are the Onboard Diagnostic Center. This advanced system comes with their own microprocessor controlled diagnostic system. The LCD display the operation of the boiler on a 2 x 20 character screen that will show only instructions and readings in English. There are no more confusing codes or manuals to interpret the XFyre’s readings. You will find this system will monitor safety, day-to-day operations as well as ignition faults and system status. These condensing boilers are fabricated with a 316L stainless steel heat exchanger, which is ASME-H, stamped. They also come with a sturdy cabinet that will protect the controls and wiring from the elements. Each boiler meets and exceeds all current Low NOx regulations. This includes the new 2010 SCAQMD revisions. These boilers are rated for 0-10 VDC inputs for BMS interface. 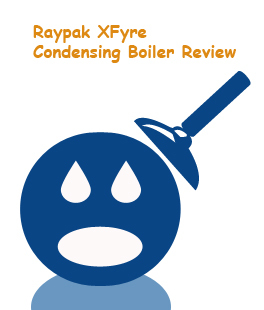 There are even some options available for the Raypak XFyre Condensing Boiler. Some of these options include a Temp Tracker Mod+, this will control 16 of the Raypak XFyre, XTherms and MVBs. Another option is the Direct Vent, which uses the TruSeal combustion air inlet system, and a Condensate Neutralizer Kit. Be sure to choose the correct boiler size for your application, this will ensure proper and maximum efficiency. Contact your local Raypak Dealer for more information and for any questions that you may have. Each Raypak XFyre Condensing Boiler comes with installation instructions as well as wiring displays. Each boiler is factory tested before being shipped out. 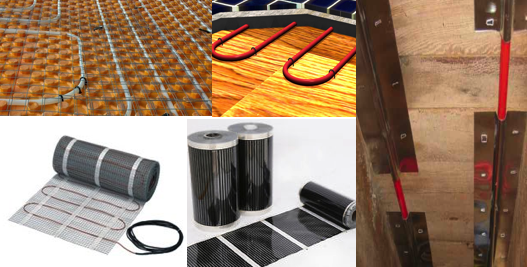 It is recommended that a qualified professional provide the installation. Read all of the warranty information as well as the operating recommendations for maximum operation.